Thomas E. Weil reads an old letter. For most of us, most of the time, writing about rowing history involves finding needed nuggets in rowing history books, almanacs or magazines, scooping it from online newspaper files, or, indeed, calling upon fellow historians whose collections and archives offer resources not easily accessed anywhere else. It is much less common, especially in this age of digital communications, to spot and be able to mine an unpublished first hand source. Such an opportunity recently came my way, which I thought might be of interest to some HTBS readers. 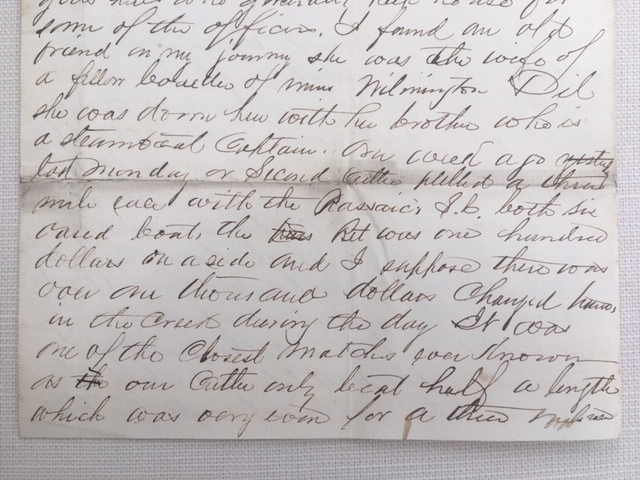 What follows is a letter, acquired at an auction of Civil War materials, written on April 7 , by Third Assistant Engineer George S. Paul (1837-1900), a Union naval officer assigned to the ironclad USS Nahant in Port Royal, South Carolina. Rowing history research process often requires one to sift through a lot of material to unearth the desired information, and reading through this document is no exception. But I offer it to discerning eyes because of the interest to be found in the particular event – a three-mile race between the six-oar cutters of two warships, the larger context – the occupation of enemy territory during war time – and the perspective of an individual far from home at that time and in that context. In transcribing the original manuscript, which is in my possession, I took the liberty of making some minor edits to provide otherwise missing punctuation. A few illegible words are indicated by ellipses, and a handful of abbreviated terms are fleshed out in brackets. Certain of the views and the vocabulary to be found in this letter may be offensive to some HTBS readers, but it must be remembered that this letter reflects vocabulary and views prevalent over a century and a half ago, and it would be even more offensive to the principles of rowing history research to alter an original source in order to satisfy contemporary sensibilities. A couple of comments on the content may be useful. The author distinguishes between “darkies”, who are presumably darker skinned Afro-Americans and “yellow girls”, who would most likely be the lighter complexioned offspring of a white father and slave mother. The Gideonites and Gids referred to would appear to be named after Gideon Welles, Secretary of the Navy from 1861 to 1869. According to Wikipedia, “Although opposed to the Union blockade of Southern ports, he duly carried out his part of the Anaconda Plan, largely sealing off the Confederate coastline and preventing the exchange of cotton for war supplies. This is viewed as a major cause of Union victory in the Civil War, and his achievement in expanding the Navy almost tenfold was widely praised.” Finally, to get a good sense of the locations mentioned, it may be helpful to pull up an online map of the area within a 30 mile circumference of Port Royal SC before diving into the letter. As to the rowing elements (bolded for the impatient), it is interesting to see that these cutter races followed the collegiate model in boating six rowers, that side bets exceeded the bet between the parties by 10-1, that the oarsmen were competing to be “Champions” of the local watercourse (a status more frequently claimed these days as “Head” of the Whosie), and that the difference in margins between the two races (half a length over a three mile course and half a mile over a one mile course) may have been, and may still be, a world record. 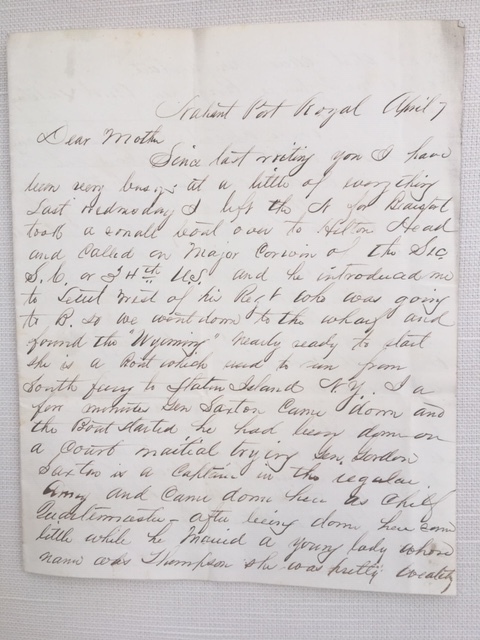 Detail of George Paul’s letter to his mother. Since last writing you I have been very busy at a little of everything. Last Wednesday I left the N[ahant] for Beaufort – took a small boat over to Hilton Head and called on Major Corwin of the Sec. S.C. or 34th U. S. and he introduced me to Lieut. West of his Regt who was going to B[eaufort] so we went down to the wharf and found the “Wyoming” nearly ready to start. She is a boat which used to run from South Ferry to Staten Island N.Y. I[n] a few moments Gen Saxton came down and the boat started. He had been down on a court martial trying Gen Gordon. Saxton is a captain in the Regular Army and came down here as Chief Quartermaster. After being down here some little while he married a young lady whose name was Thompson. She was pretty wealthy and that gave him a start and now he is Brig. Gen. and Military Gov. of S.C.
We were about an hour going from H[ilton] H[ead] to B[eaufort]. The river is about one mile wide and a good part of the way there is nothing but marsh along the shore but some of the way there is considerably nice land and on St. Helena Island Dr Jenkins owns a very nice plantation. Beaufort is a place which at one time contained maybe twelve hundred inhabitants. It was the watering place for the South Carolinians. The dwellings are all wood or mostly so and are the best and most expensive set of wood buildings I ever saw and to look down a street you would see such looking houses as Sill’s, Newbury’s, CP Wolcott’s, Dave Kings, Dr Badger’s, Simon Perkins. If only they were all painted white. The most of them have good sized yards and splendid door yards and a great many kinds of tropical trees. But most of the fences are destroyed and everything is fast going to decay. The homes are all occupied either by suttlers [sic], Army officers, Gideonites or darkies. The Gideonites are those who come down to teach and take care of the darkies and as a general all from the eastern states are called Gids. There is regular martial law here and no man can be out after nine o’clock without the password. There are fifteen or twenty darky schools in the town. All are taught by young ladies (who by the way are no pretty hard company when they are down here, as officer’s society is now the best especially when they are away from home). I stayed in B[eaufort] until Monday noon. I got completely tired of the place during my stay. I became acquainted with a[t] least a couple of hundred men and everyone asked me to drink. There are eight hundred in the hospitals and about one hundred of them are cases of small pox. The Drs are all glad to have those cases because they can [order] whisky for their patients and treat their friends with it. The man who has the most small pox cases has the most friends because at the saloons nothing stronger than ale & wine are allowed to be sold. But I suppose the patients are better without the whisky. There are a good many good looking yellow girls here who generally keep house for some of the officers. I found an old friend on my journey. She was the wife of a fellow … of mine [in] Wilmington Del. She was down here with her brother who is a steamboat captain. One week ago last Monday our Second Cutter pulled a three mile race with the [USS] Passaic S.C. Both six-oared boats, the bet was one hundred dollars on a side and I suppose there was over one thousand dollars changed hands in the creek during the day. It was one of the closest matches ever known as our Cutter only beat half a length which was very even for a three mile race. Since then our India rubber boat (Baltzer) raced with the Catskills Baltzer distance one mile in which we beat them ½ mile so our men are now Champions of the Creek. We are now having spring tide and the marsh is overflooded at high tide and the … marsh hens … all have to swim for it and we all go out in little boats each with a musket and have a fine time shooting them. Tonight Mr Grest and I went out for a row in the dinghy and we undertook to pole the dinghy across from one creek to another and when we got about half way we got stuck and had to wait for the tide to raise and then it was so dark we could hardly find our way back to the N[ahant]. I have just received a letter dated in January speaking of mother’s …. Also one from father in the same month. He says he had written to me once before but it is the only letter I have received from him. I do not know where to write to him now. Give me his address. Nothing more to write tonight as it is getting late and I must go to bed (“turn in”). I also received a paper from uncle Daniel a N.Y. Times.